There is a lot of difference in mammals' need for sleep. Daily sleep time for man is approximately seven to eight hours. An owl monkey needs 17 hours a day. A bat needs 20 hours a day. Sleeping too little or too much can be harmful to a personâs health. REM sleep is deep sleep that is more refreshing. This is because there is total muscle relaxation except for bursts of rapid eye movements. The brain is active in REM sleep, dreaming occurs in this stage of sleep. Ideally, 20 to 50 percent of an adult's sleep should be in REM sleep. During this phase of sleep, there may be irregularities of the heart and breathing. These can be recognized by monitoring the heart with an electrocardiogram (ECG). REM sleep has been described as a highly activated brain in a paralyzed body. Some sleep disorders are known to have genetic causes. Others are caused by illnesses such as Parkinson's disease, depression, lung disease, or heart failure. Other sleep disorders have an unknown cause. 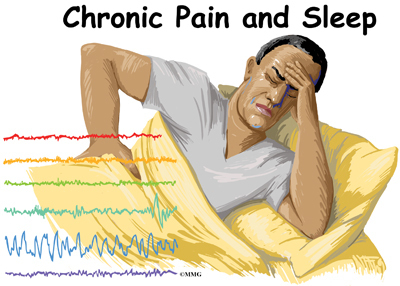 There are several common sleep disorders. Central sleep apnea is the interruption of breathing during sleep. The cause may be unknown. Or it can be caused by medications such as (narcotics). Other causes can be heart failure, stroke, renal failure, lung disease, or being at high altitudes. Some recommended sleep medications include some of the antidepressants. Drugs that stimulate the breathing reflex may be used for central sleep apnea. Specific medications are also used for narcolepsy. Medications that treat Parkinsonâs disease can be beneficial for RLS and PLMD. Our bodies make melatonin that helps regulate the sleep cycle. It is also available as an over-the-counter medication. It is most helpful for shift work and jet lag. When soft tissue in the nose or throat is enlarged, it may be recommended that you use decongestants or other medications that help shrink soft tissue in your nose and throat. Behavioral treatments often mean changing the way you act or think. You may need to learn how to decrease stimulation of the body's system of alertness. This system is called fight or flight and can interfere with proper sleep. When your nervous system is on high alert, it is especially difficult to fall asleep. Reducing stress, doing relaxation exercises or other soothing activities can calm the nervous system. Changing negative attitudes about yourself and sleep can also be helpful. There are many simple ways that sleep can be improved. Bedtime rituals such as a bath, reading for pleasure, or listening to soothing music may help decrease your bodyâs alertness. Regular sleep schedule is important. Wake and get up at the same time each morning, including weekends, even after a poor night's sleep. This will help with the circadian rhythm. Avoid caffeine particularly after the middle of the afternoon. If at all possible, decrease or don't drink caffeinated drinks altogether. You may have to taper off of caffeine. Most people will have symptoms of withdrawal. These could include headache and fatigue. Avoid medications that may interfere with either falling asleep or staying asleep. Narcotics for pain may cause a decrease in the brain's ability to keep breathing during sleep. This can cause a decrease in oxygen level in the blood. If your airway is small, especially when the soft palate (top of the mouth) and the tongue relax during sleep, it may be recommended that you have reconstructive surgery. The most common type of reconstructive surgery is called uvulopalatopharyngoplastyor UPPP. Excess tissue such as the tonsils, adenoids, and uvula are removed. These surgeries are usually performed by an otolaryngologist, or ear, nose, and throat (ENT) surgeon. Some cities have support groups for people with sleep disorders. Check with your physician or through your local hospital to see what support groups are avaialable.